Providing you the best range of ferro silicon, ferro silicon granule, ferro chrome, ferro manganese and ferro silicon magnesium with effective & timely delivery. 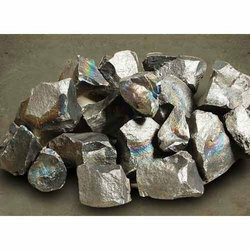 Being counted as one of the leading importers & traders, we offer a wide range of Ferro Silicon. Our range has found its vast applications in Foundry & Alloy Steel industries. Also, our range is reckoned amongst the clients for its formulations. Ferro silicon is an alloy of iron and silicon with between 15% and 90% silicon. It contains a high proportion of iron silicates. Its melting point is about 1200 °C to 1250 °C with a boiling point of 2355 °C. It also contains about 1 to 2% of calcium and aluminum. Ferro silicon is used as a source of silicon to deoxidize steel and other ferrous alloys. This prevents the loss of carbon from the molten steel. It is applicable to manufacturing of cast iron and steel grey iron. We offer a wide range of Ferro Silicon Granule. This range is reckoned amongst the clients for its various uses. Our range is used in low alloy steel, bearing steel, heat-resistant steels and electrician silicon-steel, ferro alloy production and various others. Our range is free from every contamination. Besides, our range is known for its efficiency and quality and available in the market at reasonable prices. Ferro Chrome (FeCr) is an alloy of chromium and iron containing between 50% and 70% chromium. It is mostly used for making stainless steel. The exclusive range of Ferro Chrome is widely used in the production of Stainless Steel in order to provide it with an accurate finish. This range is available in the market at competitive prices. A quality range of this product is offered by us that is highly appreciated by the clients. We are mainly looking queries from Himachal, Punjab, Haryana, Delhi and Jammu Kashmir. We ring forth our clients an extensive range of Ferro Manganese. This range is a mixture of Ferro alloy and manganese as it is made by heating this mixture. Our range is highly demanded by the clients for its supreme quality range. Due to the increased demand we are getting consistent orders which help us to carve a niche in the industry. As well, our range is made available in the market at competitive prices of the industry. We are one of the most trusted names in the industry for distribution of Ferro Silicon Magnesium procured from MINEX Metallurgical Co. Ltd. The quality of the product is the matter of prior consideration for our company. We have an experienced panel of experts in our company who are skilled enough to provide best quality products. 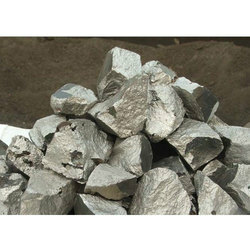 Ferro Silicon Magnesium that we offer is demanded by the clients for its various specifications and features. It is a vital alloy for manufacturing Spheroidal Graphite Iron and widely used in less carbon grades of steel as it contains low contents of carbon. Besides, Ferro Sillicon Magnesium contains 5-10% of magnesium and around 1-1.5% of rare earth metal.